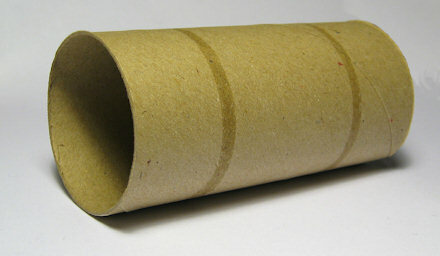 I’m experimenting with making rabbit toys from the cardboard tubes in toilet rolls at the moment, and I’ll be posting the instructions and results. If you have any toy suggestions then please post them in the comments for me and Scamp to try out. 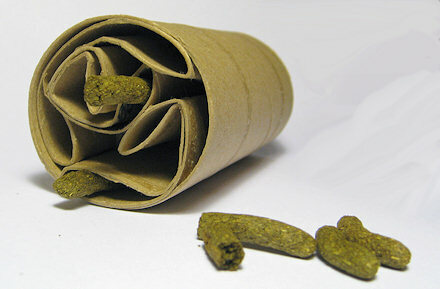 The first toy I tried is a toilet roll stuffed with more toilet rolls and a tasty treat. 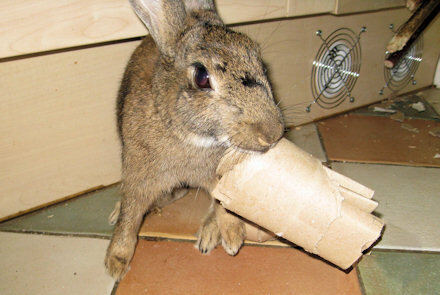 To make this bunny toy you will need: four toilet rolls tubes (or two kitchen roll tubes cut in half) and something tasty. I tried pellets and carrot sticks but any vegetable or treat would work. Something long and thin or that will roll up (like a cabbage leaf) would work best. Intrigued? Read on…. 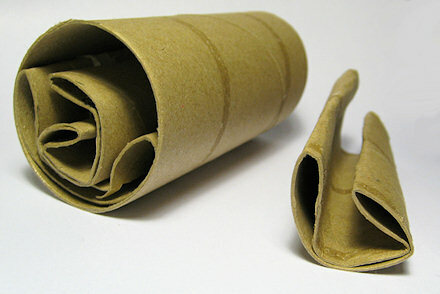 Step 1: Flatten three of the cardboard tubes and fold/roll then length ways. Step 2: Push the three flattened tubes into the fourth tube. Step 4: Give to rabbit for shredding. 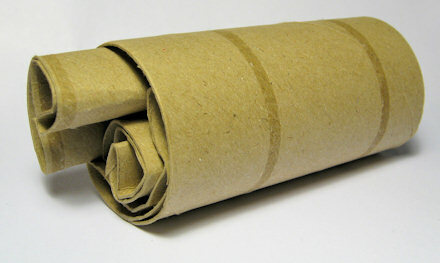 Fold up the other three cardboard tubes. This entry was posted on Friday, December 3rd, 2010 at 6:59 pm	and is filed under Toys & Enrichment. You can follow any responses to this entry through the RSS 2.0 feed. You can leave a response, or trackback from your own site. The look great, we’ll try that next! That’s a great idea. I actually have a collection of TP tubes in the bathroom waiting to be gifted. It’s also a nice way to “recycle” the ones that have gotten stepped on or partially chewed once my rabbits lose interest. For some reason, they prefer the paper towel rolls, but I often just g ive them the roll with nothing in it and they’ll chew it. Putting used ones inside is a great idea to give them substance, I’m going to try it tonight. The other thing I’ve often done is just to stuff the tube with hay. May be a little more boring and maybe a little more messy, but it’s healthier than giving them a toy full of treats and seems to keep them JUST as busy. especially if I use “special” hay, like orchard grass, meadow mix or oxbow botanical, as opposed to the timothy hay they’re used to. Aww.. too bad my Momo doesn’t like to chew anything except her carpet. She threw around a cardboard toilet roll for about 5 minutes and it’s still there in tact. Most of the time rabbits just shred the cardboard rather than eating it. Eating a little bit won’t hurt but if your rabbit eats it like its food best to avoid it. Sometimes they do eat cardboard if they don’t have enough roughage eg hay available.